Following Monday’s contest against the Detroit Tigers, ESPN analyst and former Boston Red Sox manager Terry Francona expressed his outlook toward the local nine. The Sox have won three consecutive contests, but remain locked in fourth place in the American League East. They’re eight and a half games behind the New York Yankees, as well as four games behind Oakland for the Wild Card. However, despite the distance between them and New York and Oakland, Francona believes that their current winning streak may be exactly what Boston needs to propel them toward the playoffs. “This is the timing. They’ve got nine more games left at home, they’ve finally fought their way over .500, they need to stay there and gain some ground,” added Francona. Boston is 26-28 at Fenway Park this season, and will attempt to continue their current trend for the next few days against Detroit, Minnesota and Texas. Question of the Day: Do You Believe In The Red Sox? OK… OK…OK… After Friday’s awful performance against the New York Yankees, the Boston Red Sox currently reside in the American League East basement. They’re 49-51 overall, and have lost seven of their last 10 games. If they’re going to make a so-called, “run,” they’ll need to win at least 42 games to conclude the season with 91 wins. Yet, can they do it? Do you believe in this team? Does this team have what it takes to earn a Wild Card spot in the American League? Post your thoughts below or continue the conversation on Twitter (@NoonSportsBlog) or Facebook (Facebook.com/NoonSports). Once Monday’s news was announced about Roger Clemens, it became quite easy to realize that government and sports don’t coincide. Clemens, who was acquitted of charges toward lying about steroids and human growth hormones to Congress in 2008, was officially sent out of a Washington courtroom as a “free man” on Monday. And while many are continuing to scratch their heads over this particular case, it certainly emphasizes the fact that an athlete is more powerful than a group of non-baseball fans, ahem…the jury. Of course, he will certainly be remembered as one of the greatest pitchers to ever play the game. The Rocket spent 24-years in the big leagues, and walked away with a record of 354-184 on the bump. He appeared in 11 All-Star Games, earned seven Cy Young Awards, paced the American League with the most wins by a flame-thrower in ’86, ’87, ’97, and ’98, and was awarded the Most Valuable Player (MVP) Award in 1986. Baseball has become a game of cheaters. Players seem more focused on their various accolades than winning a World Series, and the same could possibly be said for Clemens, right? Clemens will certainly be remembered as a cheater, as well as someone who maneuvered his way forward with various performance enhancement drugs to extend his career, and one example could be seen when he joined the Toronto Blue Jays for a two-year stint in ’97-’98. The right-hander hadn’t earned 20 wins or more since the 1980’s, and after a few up-and-down seasons with the Boston Red Sox, Clemens’ numbers skyrocketed in Canada, as he won 41 of 54 games. He also earned two back-to-back Cy Young Awards, too. So, did the government strike out or did Clemens earn himself another win for the record books? Well, according to the New York Times, this particular trial was a so-called, “waste of government time, and money.” Clemens became the second Major Leaguer to sneak through the cracks — the first was Barry Bonds, who was sentenced to one month of house arrest after a seven-year investigation in April of 2011. And while Bonds was convicted on one of four charges, (obstructing justice) he still managed to walk out of the courtroom. Clemens avoided 10 years in federal prison, but will now be faced with the difficult task of convincing the baseball writers that he deserves a spot in the Cooperstown, (he’ll need 75 percent of the ballots to earn a spot). All in all, I believe that he cheated. Clemens, Bonds and others turned America’s Pastime into a game that’s no longer linked to the days of Ted Williams, Babe Ruth, Hank Aaron and others. I’m not sure, but once again, the government failed to send a message to all baseball fans and players that cheating is not allowed in a game and life. It’s “hump day,” which means this week is somewhat over, right? OK… OK… here are some headlines, news and stories from the city of champions. 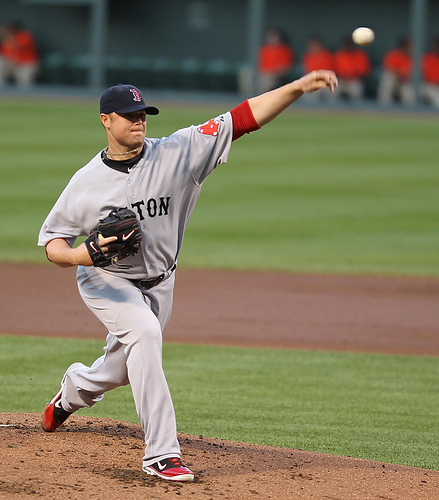 * The Boston Red Sox earned their 25th win of the season on Tuesday, as they defeated the Detroit Tigers, 6-3. David Ortiz cranked his 11th home run and 18th double of the season, while Daniel Nava recorded three RBIs. Also, Daniel Bard picked up his fifth win on the bump by tossing 5.1 innings and yielding five hits and two earned runs. Bard also recorded four strikeouts before he was relieved in the sixth for Rich Hill. * Boston has now won 12 games at Fenway Park this season, and will attempt to even their home record on Wednesday against the Tigers — Jon Lester faces Drew Smyly — first pitch is scheduled for 7:10PM. * The New England Patriots announced on Tuesday that they released the 2007 first-round draft pick of the Indianapolis Colts, Anthony Gonzalez. The wide out, who was a free agent this past winter, has been hampered by injuries and hoped to revive his career in New England. * Finally, the Boston Celtics will attempt to even their Eastern Conference Finals series with the Miami Heat on Wednesday — tip is scheduled for 8:30PM. Happy Friday to everyone, and welcome into the final Daily Noontime of the week! Let’s kick-off Memorial Day Weekend with some news and headlines! * The Boston Red Sox and Tampa Bay Rays will begin their three-game series on Friday at Fenway Park — Jon Lester opposes Alex Cobb — first pitch is scheduled for 7:10PM. * According to various reports — Bobby Valentine strongly believes that if the Sox continue to play the way they’ve played the past 20 games, they’ll win the championship. Boston is 18-12 since blowing a nine run lead to the New York Yankees on April 21, which is the third best record in the American League behind Baltimore (20-10) and Tampa Bay (19-11). If the Sox continue on this particular path, they’d finish their current campaign with 93 wins. * The Boston Celtics and Philadelphia 76ers will conclude their Eastern Conference semi-final series on Saturday at 8PM at the TD Garden. Boston has won three of five meetings against Philadelphia in the seventh game dating back to 1965.